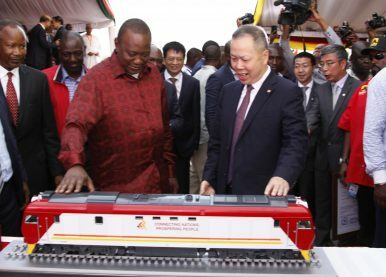 Kenyan President Uhuru Kenyatta, left, looks at a model of a locomotive with Chen Fenjian, president of CCC, during the unveiling of a cargo train at the Mombasa, Kenya, port containers depot (May 30, 2017). CIDCA may professionalize Beijing’s foreign aid agenda, but it will also institutionalize a mercantilist model of development. Xi Jinping has a global vision for China and has centralized foreign policy around himself and the CCP. In this six-part blog series, MERICS researchers take a closer look at the (new) setup of China’s foreign policy leadership, institutions, budget, and personnel – as well as on its policy approach to Europe. This is part 3; see part 1 of the series here. Beijing’s new development agency has a clear mission statement. According to the PRC’s State Council website, the “China International Development Cooperation Agency” (CIDCA) has been set up to “strengthen the strategic planning and overall coordination of foreign aid.” CIDCA is an organization designed to cut through the overlap and discord of the current system. In this sense it performs a coordinating role similar to that of aid agencies in other donor countries. All in all, it’s easy to count 33 agencies involved in foreign aid in China. The two principal actors in this landscape are the Ministry of Commerce (MOFCOM) and the Ministry of Foreign Affairs (MFA). The two ministries’ control over policy decisions in aid has often resulted in a tug of war, with a long-term political agenda clashing with MOFCOM’s emphasis on short-term commercial interests. On the ground, this contest plays out between the Economic and Commercial Counsellors’ (ECC) offices, staffed by MOFCOM personnel, and local ambassadors. Although the ECCs technically report to the MFA, the final say on aid projects often lies with MOFCOM, not least because of MOFCOM’s close relationship with local (often state-owned) Chinese companies seeking out new projects and relationships with local elites. CIDCA has emerged to combat this fragmentation and to improve the “efficiency” of China’s foreign aid apparatus, i.e. to increase the control over policy direction by the Communist Party. Tasked with “strategic planning” and “coordination,” it will “integrate the responsibility of MOFCOM” with that of the MFA as an “institution directly under the State Council.” It will, in other words, be a one-stop shop for disseminating important decisions on aid and coordinating the agencies tasked with implementation. The CIDCA’s new boss, Wang Xiaotao, is the right man to play this coordinating role. A former deputy director of the powerful National Development and Reform Commission (NDRC), he is well practiced in mediating between China’s competing ministries. In the context of the MOFCOM-MFA struggle for control of aid policy, he is also something of a neutral choice for leader. The appointment of his deputies, Deng Boqing and Zhou Lijun, from MOFCOM and MFA respectively, represents a similar compromise between the two ministries. It is worth noting that CIDCA has no direct authority over MOFCOM. Officials have been unequivocal about “implementation” of aid remaining with the agencies currency responsible, and so it is not yet clear how CIDCA’s “planning” and “supervisory” functions will work in practice. One option voiced in Chinese media is the establishment of “development representatives” alongside the ECCs tasked with carrying out projects on the ground. If CIDCA is successful in providing a more effective channel for Beijing’s strategic foreign policy goals, short-term commercial interests will be less able to influence the foreign aid agenda. This is not the same thing as the relegation of commerce to the back benches. CIDCA in fact institutionalizes a concept of “development coordination” to which Beijing’s commercial interests are vital. In his work at the NDRC, Wang was also extensively involved in the promotion of the BRI. Given the official statement on the BRI’s relevance to CIDCA’s work, it is likely that promoting the initiative will be an important function of the new agency. The BRI consists for the most part of strategically relevant infrastructure projects carried out by Chinese companies, using loans from banks like China’s Exim Bank. The BRI is typical of the pragmatic, profit- (commercial or otherwise) orientated model that has long characterized Chinese aid – a model that jars somewhat with the OECD’s conception of development assistance. However, it fits perfectly with Beijing’s understanding of “development cooperation.” English language media has described CIDCA as a “new aid agency,” but it is significant that the word “aid” (援助) is nowhere in the agency’s title. Instead, the agency’s refrain is moving “from ‘foreign aid’ to ‘international development cooperation’” (从‘对外援助’到‘国际发展合作’). “Development cooperation” consists less of grants and volunteerism, and more of bank loans and the construction expertise of Chinese companies. In the language of the party, it is about mutual, “win-win” growth, rather than assistance. China plays many roles, depending on the context, and the identity of China as an emerging economy often defines Beijing’s approach to developing countries. This shapes Beijing’s understanding of foreign aid. As Chinese academic Zheng Yu recently put it at a CIDCA-related event, “the relationship between emerging economies and low-income countries is comparatively close.” Aid in this context is about “mutually beneficial cooperation rather than relations of donor and recipient.” Just last month, Wang Xiaotao, in his capacity as director of CIDCA, signed an 800 million Chinese RMB ($117 million) agreement with Belarus, financing a swimming pool and a new housing district. This sort of development assumedly benefits Chinese commercial interests at least as much as it helps the Belarussian economy. Summing up, CIDCA may help professionalize Beijing’s foreign aid agenda, but this does not mean an alignment with OECD standards. Negative reactions to some of the more mercantilist elements of BRI have perhaps taught Beijing that it needs to rein in some of the excesses. But the pragmatic, commercial nature of “development coordination” will not fundamentally change – it has in fact been institutionalized with the creation of CIDCA. Jacob Mardell is a project assistant at the Mercator Institute for China Studies (MERICS) in Berlin, Germany. In 2017, I asked if Xi Jinping’s signature strategy was increasing crime and terrorism. Today, are we any closer to an answer?